The Virtual Enterprise Data Warehouse (EDW) software is functional, and has proven its value in various projects as prototyping and education tool. Examples are available to test and work with the software, but it needs to be configured first. To do this, follow the steps below. As a prerequisite, at this stage the software only supports SQL Server (2012 upwards) and an instance to deploy the repository needs to be available. We are working to develop a version that only uses text files (JSON to be precise) as a data store so a RDBMS is no longer a requirement. Install the client software. The latest version can be downloaded here. This is a simple install script that creates a start menu and desktop shortcut. The most important part is making sure the metadata repository connection is correct (see the screenshot below). The connections are native SQL Server connection strings, such as for example connectionStringIntegration|Server=<server>\<instance>;Initial Catalog=<database>;Integrated Security=SSPI. Any connections to databases that contain objects related to areas in the EDW architecture can be specified in this part of the software as well. Please consider the screenshot below. Deploy the repository. This is where the metadata is stored, and some of the back-end logic for automation is executed. 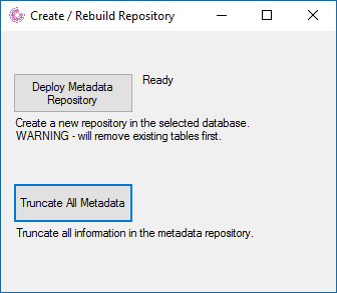 You can create your repository from the tool (Metadata menu / create repository) but you need to have your database connection to your metadata database configured already as per item 2. The result should a set of MD_ tables being created in your designated database. To see if everything maps out, restarting the tool is the easiest way to go. The above is a one-off setup.